CASABLANCA — Protesters are set to mark the first anniversary of Morocco’s February 20 pro-democracy movement with demonstrations and strikes across the country starting Sunday. But activists say that, rather than a celebration, the protests will be a reminder to the regime that they will not give up before their calls for reform are answered. “We are advocating for a democratic constitution that will give real power to a government that currently still doesn’t have enough weight to respond to our demands,” said Youness Bensaid, 23, a Casablanca-based activist. A year later and with a new government in office, Morocco still faces huge economic and social challenges. There are frequent cases of self-immolation such as the one that set off the revolution in Tunisia. In the northeastern city of Taza, protesters demanding relief from soaring prices clashed with the authorities in recent days. Nabila Mounib, secretary general of the Unified Socialist Party — which is not part of the new government after boycotting elections last year but which supports the protest movement — went to Taza to evaluate the situation after about 150 people, including police officers, were hurt. She said there was an urgent need for the government to improve the lives of ordinary citizens and to give the young hope for a better future. Analysts say the protest movement failed to galvanize large sectors of society because, after the initial euphoria inspired by the Tunisian revolution, people were deterred by the chaos in Libya, Syria, Yemen and Bahrain and by difficulties in Egypt. The Moroccans, they say, are anxious to preserve stability. Still, while the uprising of Morocco’s youth brought concessions that unions and human rights groups had failed to obtain in the previous decade, observers say that the real victory is a widespread awakening of political awareness. On Feb. 20, 2011, Mr. Bensaid, a finance student at the Hassan II University in Casablanca, joined the thousands who took to the streets to protest the same problems that cripple many Arab countries: social injustice, corruption and a lack of personal freedoms. 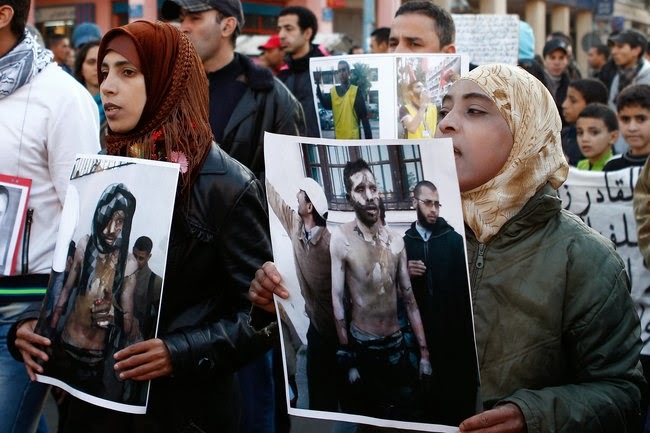 Observers say that the key difference between Morocco’s uprising and those in other Arab Spring countries is that the population, deeply attached to its 1,200-year-old tradition of monarchy, never called for regime change. Still, Sunday protests have become a weekly ritual. Except for the occasional police crackdown, most are peaceful, well organized and almost celebratory, with cheerful marchers waving placards and chanting the ills of their country. Last July, a referendum on the new constitution won 98.5 percent of the vote. Elections followed on Nov. 25, allowing the moderate Islamists of the Justice and Development Party to form a new government under Prime Minister Abdelilah Benkirane. “The government is taking the necessary measures to implement the new constitution and to consolidate the rule of law in our country,” the government spokesman, Mustapha Khalfi, said recently, insisting that major economic reforms would be pushed through. “The first question is whether there is going to be a shift in the balance of power between the king and political institutions,” said Marina Ottaway, a senior associate at the Middle East Program of the Carnegie Endowment for International Peace in Washington. Meanwhile, the new justice minister, Mustapha Ramid, has started cracking down on corruption. But protesters say this is not enough and fear that the government won’t effect radical reforms.